A number of bookmarks have been set in the Table below, to allow easy navigation. Simply click on the underlined word(s) to jump directly to where you want to go to. Each bookmark section will offer you the opportunity to jump back to the beginning of this Factfile as well. Index and Hypertext links are provided in the Table below, to allow easy navigation to specific information. Click HERE to return to the Factfile List. I would like to quote the following, from a translation of a quotation by the eminent German biological scientist, Albert Pfeffer which he made in 1897, concerning intercellular communication in plants. "General physiological considerations on the establishment and maintenance of correlative harmony, in short how the chain of stimulus transmission, renders a continuity of the living substance so essential that it would be necessary to propose it, even if it were not already discovered. However, it is quite likely that the connections would also be utilized in the transport of substances and even, in particular cases, principally or solely for this purpose." In the same year, Eduard Tangl observed intercellular strands between cotyledonary cells of Strychnos nux-vomica which he interpreted as protoplasmic contacts. He is accredited as having launched the visionary concept that cell-cell communication integrates the functioning of plant tissues. Thus ever before plasmodesmata had been recognized, Pfeffer and Tangl realized that intercellular communication between living plant cells was of necessity vital to the well being , not only of the living cells, but of the plant as well. He realized that there was an absolute necessity that living cells needed to somehow communicate ‘information’ to one another. He realized that intercellular communication was somehow, a central issue in the day to day life of plants. We might begin this discussion with a few questions that need to be addressed. Do they remain functional throughout the life of the cell and by implication the plant as well? What is their fine structure? narrow strands of cytoplasm that connect neighboring plant cells across the intervening primary cell wall, lined by the plasmalemma and thus are extensions of the cytoplasm. They may be associated with additional sub-structures ( see 5 below) which may be involved in molecular trafficking. In terms of general plant physiology, plasmodesmata are structures which elevate a plant from being a mere collection of cells, each individuals in their own right, into an interconnected commune of living protoplasts. Cells or tissues which are remote from direct sources of nutrient can thus be nourished by diffusion or bulk flow of these nutrients via plasmodesmata. Furthermore, substances can pass through them to and from the long-distance transport tissues of the plant. They could represent potential pathways for the passage of signals, either electrical or hormonal, that could integrate and regulate the activities of different parts of the commune. Their very presence constitutes a challenge to the biophysicist - how can we compute their contribution to the overall function of the plant? 2. How do they form? Primary plasmodesmata are generally formed during the early stages of cell wall formation, that is, they exist at the time when cytokinesis results in the formation first, of a phragmoplast, and then of the developing primary cellulosic cell wall. They begin as strands of endoplasmic reticulum -- some authors state these are ‘trapped’ by the phragmoplast, but this is not necessarily the case. None the less, the ER crosses the phragmoplast and developing cell wall. One must assume that there is some ability to direct cell to cell, and nucleus to nucleus communication, from a very early stage in the development of these structures. Under some circumstances, there is a possibility that modifications of the cell wall, may give rise to the formation of secondary plasmodesmata. Secondary plasmodesmata are formed for example, at the site of the scion in a graft union, where the grafted material has to form lines of communication between the differing cell lines, to allow the passage of small molecules and other information signals from the one cell to the other. Recently, there has been a great deal of discussion concerning the structural modification of plasmodesmata, where virons and virus material traverses cell-cell domains. In particular, at such sites, there is evidence that the plasmodesmata may become modified, and branched plasmodesmata are argued, as being evidence of virion and virus passage. However, the debate rages on, as to whether these branched plasmodesmata, really constitute secondary plasmodesmata, as they (a) were there before the virus infection and (b) do not interconnect ‘unlike’ tissues -- i.e., the cell connections existed before the infection and have therefore only been modified. 3. How do they function? Much has been written about the potential mode of action/function of plasmodesmata. What we do know, is that they are capable of allowing passage of relatively small molecules (usually molecules with a molecular mass of less that 800 Daltons is quoted). We do know that they are involved in molecular trafficking, and we do know that there are several viruses that have been shown to (somehow) be able to pass through, by (a) either unravelling themselves, and passing the virion through as a linear molecule, or (b) perhaps by modifying the substructural arrangements of the otherwise very tight substructures structures that constitute what we call plasmodesmata. Clearly, their function must be related to their structural simplicity or structural complexity. This is what fascinates us about them! So small, so finite yet so difficult to resolve! Thus is can be argued that their ‘gating ability’ will in part, be due to the substructural arrangement within the plasmodesmata themselves. The more complex the substructure, the tighter the control or gating may become. Conversely, the simpler they are the less complex the gating ability, and the wider becomes the range of small molecules which may pass through them. In addition, it is clear that there are many forms and structures visible within plasmodesmata. Interesting debate goes on, concerning the level of complexity, related to (a) evolution of the species; (b) ‘needs’ within cells and particular tissues. Again a question which as yet has no single answer. One could argue that during the course of development, there exist times when a distinct ‘need’ to transport substances exists, whist at others, it may be important that the same substances (or related molecules) are not. Here, an example is that of the potato tuber. During development of the tuber, it acts as a strong local sink for carbohydrates, which usually enter as sucrose, and are metabolized to starch. As the potato tuber looses sink capacity during the latter part of the growing season, so transport towards that particular sink will slow down, and may well even be prevented, by gating the plasmodesmata (simply shutting them, cannot be excluded here). Other local sinks may strengthen as a result. The formation of meristematic regions from which new vegetative plant material may sprout, is a visible manifestation of the reversal of the storage capacity and biochemistry of the potato tuber. In the early stages of re-growth, it becomes a strong source, and material that is stored, becomes re-mobilized and redistributed in the growing vegetative plant. Plasmodesmal functionality will have to be re-instated and they will have to act in a reverse role, allowing the passage of substances from the tuber towards the rapidly developing vegetative plant body. Clearly, the concept of ‘gating’, reversibility and functionality are difficult and will continue to be the source of debate and experiment for some time to come. 5. What is their fine structure? To most of the biologists that work within the area called cell communication, plasmodesmata are objects of fascination - so small, that their finer details are close to the very limits of resolution with available methods of observation - posing many problems in connection with their mode of formation, development, differentiation, frequencies of distribution and possible function. One of the first studies relating to the ultrastructure of plasmodesmata, was a report in Nature, in the mid-1970’s by AW Robards, who is credited as being the first "plasmodesmologist" to attempt to define, using the electron microscope, the general structure of a plasmodesma. Robards reported in the Nature paper, and in subsequent review articles, that even though plasmodesmata were substructurally complex, but that they appeared to have a number of features of commonality across species. Lined by the plasmalemma - all studies to date support the concept that plasmodesmata are lined by the plasmalemma, thus ensuring physiological control of the passage of materials through the plasmodesmal canal within. Substructural composition - since the mid 1970’s there has been general agreement on the terminology used to describe and name the major components that are visible with the electron microscope, and which have been shown to occur within plasmodesmata. that it is compressed, thus forming what is thought to be the central "rod". If the ER becomes condensed (appressed) then the question which the use of this term raises, is appressed to what? The term appressed was first applied by Esau, in her description of the ER sheets, which occur in many species of dicotyledonous phloem sieve element,. Here, the ER sheets are truly ‘appressed’ to the plasmamembrane. A great deal of debate continues concerning the structure-function relationships of plasmodesmata. Clearly, there are evolutionary aspects, which tempt us to speculate that "simple" plasmodesmata occur in "more simple plants" but, this is as in all biological science, not strictly true! Take for example the members of the Charales. They are generally believed to be one of the more important direct lines of evolution of the higher land plants. Some authors have stated that the plasmodesmata of the Charalean plasmodesmata reflect their simple origins by virtue of the absence of any substructural details, such as a desmotubule, or central rod. Others argue, that these structures most certainly are there but that we just cannot see them using present fixation techniques. Some recent work, using high pressure frozen material and digital image enhancement studies have suggest some alternative detail structure in plasmodesmata. Following on the evolution of plasmodesmata, the plant body is in essence, composed of two major compartments, the symplasm and the apoplasm. The apoplasm being the non-living part, the cell walls, whilst the symplasm being the living part or cytoplasm. Unlike the animal cell in which full use is made of the apoplasm and its elaborations to transport intercellular fluids such as blood and lymph fluid, plant cells are by necessity constrained in their ability to make maximal use of the apoplasm. The apoplasm itself has a low carrying capacity. Plasmodesmatal connections can be thought of as allowing for both diffusion and mass flow in directions which can be specified by concentration gradients or by osmotic or hydrostatic forces generated within the symplasm. The may be regulated by a number of interactive processes, in which the formation of callose (B 1,3-glucan) is a predominant factor. The image above shows plasmodesmal pit fields between adjacent staminal hair cells in Tradescantia pallida. Even at this magnification, individual plasmodesma can be imaged, in this aniline-blue stained Fluorescence microscope image. Within the structural confines of what is a very small structural entity, plasmodesmata would appear to possess two potential pathways: of these the desmotubule, if it is indeed a derivative of ER, is part of a closed, membrane bound system that could in theory carry specially selected and sequestered solutes. It is of interest that the other pathway, the cytoplasmic annulus, is on the one hand more prone to the hazards that might be associated with leakage of large cytoplasmic molecules, and on the other hand, is often equipped with constrictions that would reduce this danger. (so called sphincters). Take a look at the electron micrographs below. These are in mesocarp tissue in developing Avocado fruit. Note that the plasmodesmata are often associated with endoplasmic reticulum. In many cases this ER is rough ER (RER) because of its association with many many ribosomes. (E) above shows some plasmodesmata in almost true transverse section. Here, you can make out the outer and inner plasmalemma leaflets (OPL and IPL respectively). constitutes the FREE SPACE. movement is thus regulated by OSMOTIC FORCE accumulation requires energy. In some instances (c.f. Evert articles) sphincters have been reported - some speculation that these may open and close by some mechanism, thus effectively controlling all movement of solute through the plasmodesmatal canals. One of the chief regulation components may be calcium-induced callose formation, as indicated in the cell-cell communication in plants factfile. A. Simple plasmalemma-lined pore--no desmotubule. (mainly in algae, occasionally reported from higher plants). B. Loosely bound strand of ER - often reported during late stages of cell plate formation, may persist in some cases - two separate opportunities for symplasmic transport exist. C. Tightly bound desmotubule - a constriction or "neck" appears to block any possible pathway between the plasmalemma and desmotubule. Redrawn and adapted from Robards and Lucas 1990. Fig. 3. Shows further variations in plasmodesmal structure. "Among cell types of the minor vein-phloem, plasmodesmal connections are by far more numerous between sieve tube members and companion cells, than between any other cell types of that tissue." 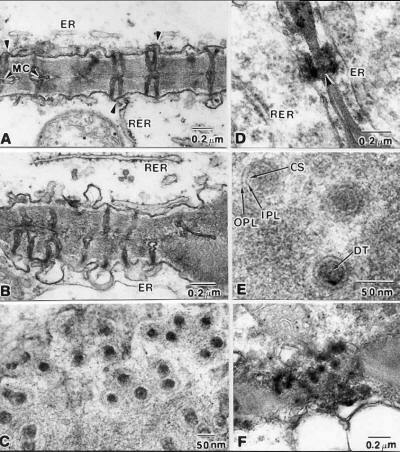 "These "numerous connections" typically consist of pores on the sieve tube side of the wall and much branched plasmodesmal connections on the companion cell side." "The frequency of connections between other cell types (companion cell-companion cell, and companion cell, phloem parenchyma cell) of the phloem varies considerably among species. " are also common. Clearly, there has been a great deal of interest in the role that plasmodesma may play in the loading and trafficking processes, and it is also apparent that their frequencies between various cell wall interfaces are variable. What is not clear from the literature, is how many are needed to fulfill their assumed transport function or how many are in fact functional? What is the significance of different measurement procedures? What is the significance of their presence? Are they functional or not? These, and other questions related to plasmodesmal structure and function, are answered in Factfiles # 5, The source-sink connection. When they arise during cytokinesis and cell plate formation from the fusing of Golgi-derived vesicles – thought to be a direct product of the endoplasmic reticulum. Traverse cell walls in pits fields or singly. Plasmodesmal frequencies decline a cell wall expansion is continued. These are termed primary plasmodesma. Current flow. Many authors have shown that electrical potentials may be transferred from cell to cell via plasmodesma. 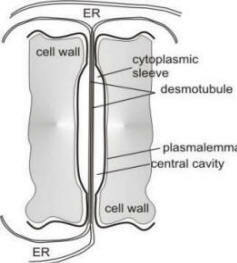 Transfer from cell to cell is assumed to be via the cytoplasmic sleeve or via the desmotubule. Plasmodesma that undergo modification after formation, or those which are formed at the scion during grafting, are called secondary plasmodesma. There is evidence that plant viruses may alter the structure of the primary plasmodesma, thus forming secondary plasmodesma. If they are formed de novo then they are true secondary plasmodesma. Trafficking – Small molecules (< 1 kDa) have been shown to traffic easily along diffusion gradients. These molecules are assumed to be confined to the intrinsic spaces within the cytoplasmic sleeve. Transport is diffusion, or may involve pressure flow. Plasmodesma may become modified with deposition of additional cell wall material (associated with the primary wall). These plasmodesma are modified primary plasmodesma. Macromolecules have been shown to be able to be trafficked under certain circumstances. Viral proteins and viral nucleic acids, small proteins and mRNA may traffic. Diameter across outer plasmalemma membrane leaflet varies from 70 - 120 nm. Evidence for plasmodesmal size exclusion limit (SEL) with raffinose series sugars. Plasmalemma leaflets have been demonstrated to exist as a helix of electron-dense and electron-lucent structures. These are interspersed with and connected to the central desmotubule (confusingly referred to as ‘appressed ER’ in some literature) by fine spoke-like structures. Electron microscopic imaging has been accomplished with standard chemical fixation, as well as with high pressure freezing and cryofixation. Whilst details with HPF are debatably better disadvantage is small tissue block size needed with HPF. Much significant work has been undertaken using fluorescence microscopy as well as confocal microscopy. Transport through the desmotubule would require conformational changes. The Neck Region has been demonstrated to be able to be restricted or constricted under certain circumstances. Dilation can be achieved by 2-Deoxy-D-Glucose, callose synthesis has been shown to be enhanced in the presence of 10-40 mM Ca++ , and to be retarded by the sequestration of Ca++ via EDTA. The neck region has been implicated in plasmodesmal gating which has been suggested to be Ca++ enhanced. Neck and exterior of plasmodesma have been associated with fimbrin, and or actin or myosin filaments. These filaments are suggested to play a role in plasmodesmal modulation ( see Overall, 1999). The need for a gating structure Narrowing down of the plasmodesmal orifice results in a bottleneck and may act as a rate-controlling step (Schulz 1999) Neck diameters when throttled back usually 20 – 40 nm (Overall et al. 1992; Botha et al. 1993; Schulz 1995). Cytosolic gateway would be advantageous for symplasmic solutes, as no membrane translocation step will be involved. Gating can be effected to cause non synchronous cell division in apical cells, and separation of cell domains or fields. Regulation through chelating agents that may form soluble complexes with the divalent cation. Calcium has been implicated as a messenger for a number of plant responses , it may bind to calmodulin in the cytosol (see Hepler and Wayne, 1985). Phenothyazines and calmidozolium can inhibit, by attaching to the Ca++ binding proteins. This has been demonstrated to be an active process (see Pickard and Beachy, 1999, Tucker, 1988). Control is thought to be via Ca++ and IP3 messengers. OPARKA 2005. Plasmodesmata: Blackwell’s Scientific. Highly recommended, containing up to date information about these unique and important structures. Allen, N.S. 1987. Intercellular particle movements and cytoplasmic streaming in Acetabularia cells and cytoplasts. Plant Physiol suppl., 105 (abstr.). Apitius, A., & Lehmann H. 1995. The deposition of different wall materials as a wound reaction in the liverwort Riella helicophylla. Cryptogamic Botany. 4: 351-359. Baron-Epel, O., Hernandez, D., Jiang, L-W., Meiners, S., & Schindler, M. 1998 Dynamic continuity of cytoplasmic and membrane compartments between plant cells. J. Cell Biol. 1988: 106715-721. Beebe, D.U. & Turgeon. R. 1991 Current perspectives on plasmodesmata structure and function. Physiol Plant. 83(1):194-199. Bergmans, Annette C.J., De Boer A.D., Derksen, J.W.M., & van der Schoot, C.1. 1997 The symplasmic coupling of l-2-cells diminishes in early floral development of iris. Planta, (Heidelberg). 203: 245-252. Botha, C.E.J. & Evert, R.F. 1986 Free-space marker studies on the leaves of Saccharum officinarum and Bromus unioloides. S Afr J Bot, 52: 335-342. Botha, C.E.J., Hartley, B. & Cross, R.H.M. 1993 The ultrastructure and computer-enhanced digital image analysis of plasmodesmata at the Kranz mesophyll-bundle sheath interface of Themeda triandra var. Imberbis (Retz) A. Camus in conventionally-fixed leaf blades. Ann Bot 72: 255-261. Botha, C.E.J. & Cross, R.H.M. 1997 Plasmodesmatal frequency in relation to short-distance transport and phloem loading in leaves of barley (Hordeum vulgare). Phloem is not loaded directly from the symplast. Physiologia-Plantarum. 99 (3) 355-362. Botha, C.E.J. & Cross, R.H.M. 1999 In: Plasmodesmata Structure Function, Role in Cell Communication. Van Bel AJE and van Kesteren, WJP Eds. Springer-Verlag Berlin, Heidelberg New York . Ch 2 Plasmodesmal imaging – towards understanding structure, 28-36. Botha, C.E.J. & Cross, R.H.M. 2000a Towards reconciliation of structure with function in plasmodesmata – who is the gatekeeper? Micron 31: 713-721. Blackman, L.M., Harper, J.D.I., & Overall, R.L, 1999 Localization of a centrin-like protein to higher plant plasmodesmata. European Journal of Cell Biology, 78: 297-304. Cook, M.E. & Graham, L.E. 1999 Evolution of Plasmodesmata In: Plasmodesmata Structure Function, Role in Cell Communication. Van Bel AJE and van Kesteren WJP Eds. Springer-Verlag Berlin, Heidelberg New York Chapter 7 Evolution of plasmodesmata pp 102-117. Cassero, P.J. & Knox, J.P. 1995 The monoclonal antibody JIM5 indicates patterns of pectin deposition in relation to pit fields at the plasma-membrane-face of tomato pericarp cell walls. Protoplasma 188: 133-137. Drake.G., Carr, D.J., & Anderson, W.P. 1978 Plasmolysis, plasmodesmata and the electrical coupling of oat coleoptile cells. J Exp Bot 29: 1205-1214. Ehlers, K. & Kollmann, R. 1996.Formation of branched plasmodesmata in regenerating Solanum nigrum protoplasts. Planta 199 126-138. Erwee, M.G. & Goodwin, P.B. 1983 Characterisation of the Egeria densa Planch. leaf symplast. Inhibition of the intercellular movement of fluorescent probes by group II ions. Planta. 158: 320-328. Eleftheriou, E.P. 1993 Prospective companion cells differentiate into abnormal sieve elements in colchicine-treated roots of Triticum aestivum. Protoplasma, 176: 151-164. Epel, B.L. 1994 Plasmodesmata: Composition, structure and trafficking. Plant-Molecular-Biology. 1994; 26 (5) 1343-1356. Franceschi, V.R., Ding, B. & Lucas, W.J. 1994 Mechanism of plasmodesmata formation in Characean algae in relation to evolution of intercellular communication in higher plants. Planta, (Heidelberg). 192: 347-358. Harper, J.D.I., Holdaway, N.J.; Brecknock, S.; Busby, C.H. ; Overall, R.L. 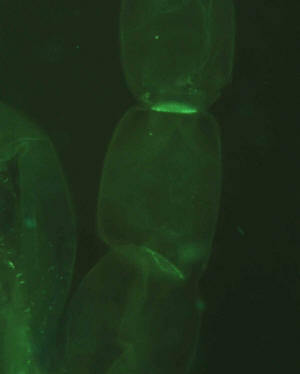 ; Blackman, Leila M. 1996.A simple and rapid technique for the immunofluorescence confocal microscopy of intact Arabidopsis root tips. : Localization of a centrin-like protein to higher plant plasmodesmata. Cytobios-. 6; 87 (349) 71-78. Hepler, P.K. & Wayne, R.O. 1985 Calcium and plant development Annu. Rev. Plant Physiol. 36: 397-439. Holdaway-Clarke, T.L., Walker, N.A. & Overall, R.L. 1996 Measurement of the electrical resistance of plasmodesmata and membranes in corn suspension-culture cells. Planta 199: 537-544. Holdaway-Clarke T.L., Walker, N.A., Hepler, P.K. & Overall, R.L. 2000 Physiological elevations in cytoplasmic free calcium by cold or ion injection result in transient closure of higher plant plasmodesmata. Planta 210: 329-335. Jane, W.N. & Chiang, S.H.T. 1993 Ultrastructure of the zygote in Arundo formosana Hack. Taiwania, 38: 26-37. Jian, L.C. Li, P.H. Sun, L.H. & Chen, T.H.H. 1997 Alterations in ultrastructure and subcellular localization of Ca-2+ in poplar apical bud cells during the induction of dormancy. J. Exp. Bot. 1997; 48: 1195-1207. Kempers, R., Prior, D.A.M., van Bel, A.J.E. & Oparka, K.J. 1993 Plasmodesmata between the sieve element and the companion cell of extrafascicular phloem in Cucurbita maxima permit passage of 3 kDa fluorescent probes. Plant J 4: 567-575. Knoblauch, M. & Van Bel A.J.E. 1998 Sieve tubes revisited. The Plant Cell 10: 35-50. Marchant, H.J. 1976 Plasmodesmata in the algae and the fungi. In: Robards AW, Gunning, BES (eds) Intercellular communication in plants: studies on plasmodesmata. Springer, Berlin, Heidelberg, New York, pp 59-80. Martindale, V.E. & Salisbury, J.L. 1990 Phosphorylation of algal centrin is rapidly responsive to changes in the external milieu. J Cell Sci 96: 395-402. Minorsky, P.V. & Spanswick, R.M. 1989 Electrophysiological evidence for a role for calcium in temperature sensing by roots of cucumber seedlings. Plant Cell Environ 12: 137-143. Monroy, A.F. & Dhindsa, R.S. 1995 Low-temperature signal transduction: induction of cold acclimation-specific genes of alfalfa by calcium at 25oC. Plant Cell 7: 321-331. Nelles, A. & Laske, E. 1982 Temperature dependence of the ,membrane potential of corn coleoptile cells. Biochem Physiol Pflanzen 117: 107-113. Olesen, P. 1980 A model for a possible sphincter associated with plasmodesmatal neck regions. Eur. J. Cell Biol 22: 250. Olesen, P. & Robards, A.W. 1990 The neck region of plasmodesmata: general architecture and some functional aspects. In Parallels in Cell to Cell Junctions in Plants and Animals (ed AW Robards WJ Lucas JD Pitts HJ Jongsma and DC Spray) pp 145-170. Berlin: Springer. Overall, R.L., Wolfe, J. & Gunning, B.E.S. 1982 Intercellular communication in Azolla roots. I Ultrastructure of plasmodesmata. Protoplasma 111: 134-150. Overall, R.L. 1999 In: Plasmodesmata Structure Function, Role in Cell Communication. Van Bel AJE and van Kesteren WJP Eds. Springer-Verlag Berlin, Heidelberg New York . Substructure of Plasmodesmata. Ch 9 pp 130-148. Radford, J.E. & White, R.G. 1998 Localization of a myosin-like protein to plasmodesmata. Plant J. 14: 743-750. Rinne, P.L.H. & van der Schoot, C. 1998 Symplasmic fields in the tunica of the shoot apical meristem coordinate morphogenetic events. Development 125: 1477-1485. Robards, A. & Lucas, W.J. 1990 Plasmodesmata. Annu. Rev. Plant Physiol. Plant Biol. 41: 369-419. Roy, S., Watada, A.E. & Wergin, W.P. 1997 Characterization of the wall microdomain surrounding plasmodesmata in apple fruit. Plant Physiol. 144 539-547. Schulz, A.. 1995 Plasmodesmal widening accompanies the short-term increase in symplastic phloem unloading of pea root tips under osmotic stress. Protoplasma 188: 22-37. Schulz, A. 1999 In: Plasmodesmata Structure Function, Role in Cell Communication. Van Bel AJE and van Kesteren WJP Eds. Springer-Verlag Berlin, Heidelberg New York . Ch 11 Physiological control of plasmodesmal gating. pp 175-204. Schumaker, K.K & Sze, H. 1987 Inositol 1,4,5 trisphosphate releases Ca++ from vacuolar membrane-vesicles of oat root. J. Biol. Chem. 262: 3944-3946. Taiz, L. & Jones, R.L. 1973 Plasmodesmata and an associated cell wall component in barley aleurone tissue. Am J Bot 60: 67-75. Tucker, E.B. 1988 Inositol bisphosphate and inositol trisphosphate inhibit cell-to- passage of carboxyfluorescein in staminal hairs of Setcreasea-. Planta, (Berl) 174: 358-363. Tucker, E.B. & Boss, W.F. 1996 Mastoparan-induced intracellular Ca-2+ fluxes may regulate cell-to-cell communication in plants. Plant-Physiology-Rockville. 1996; 111 (2) 459-467. Van Bel, A.J.E., Günther, S. & van Kesteren, W.J.P. 1999 In: Plasmodesmata Structure Function, Role in Cell Communication. Van Bel AJE and van Kesteren WJP Eds. Springer-Verlag Berlin, Heidelberg New York . Ch 1 Plasmodesmata – a maize of questions. pp 1-27. Van der Schoot, C. & Rinne, P. 1999 In: Plasmodesmata Structure Function, Role in Cell Communication. Van Bel AJE and van Kesteren WJP Eds. Springer-Verlag Berlin, Heidelberg New York . Ch 13 The Symplasmic Organization of the Shoot Apical Meristem pp 226-242. Van der Schoot, C. & Rinne, P. 1999b: Networks of shoot design. Trends in Plant Science 4: 31-37. Vasil'ev, A.E. & Muravnik, L.E. 1997 Cell component dynamics in the leaf tissues of Populus deltoides (Salicaceae) during life cycle. 2. Palisade mesophyll during growth. Botanicheskii Zhurnal, (St. Petersburg). 82: 1-13. White, R.G., Badelt, K., Overall, R.L. & Vesk, M. 1994 Actin associated with plasmodesmata. Protoplasma 180: 169-184. Zocchi, G. & Hanson, J.B. 1992 Calcium influx into corn roots as a result of cold shock. Plant Physiol. 70: 318-319.